As you can see, I doubt my computer specs are the issue for 1080p. Is there an explanation why I would be seeing this error message? Also, keep in mind higher definition videos will use more power possibly causing battery life or fan noise issues. 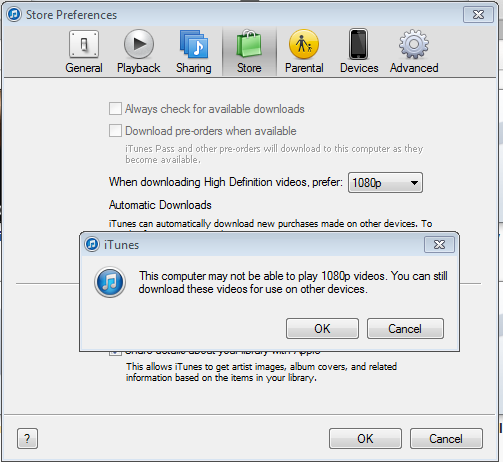 But basically, ignore the message, try watching a few 1080p videos, and if it doesn't work - switch back to 720. When the feature was first introduced most PC's couldn't play 1080p content, but it was still useful if your PC was just a NAS for whatever device your TV is plugged into. It's a poorly worded message. When I've gotten it in the past (on OS X), it's been when my screen resolution is too small to play 1080p content natively. However if you ignore the warning, it will happily play just fine, but downscaled to fit your screen. Not the answer you're looking for? Browse other questions tagged itunes windows .